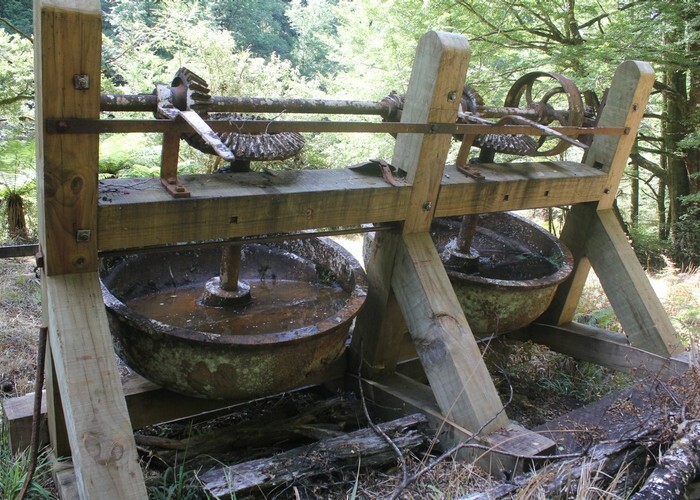 This classic circuit explore Reefton's gold history, starting from the site of the Capleston gold town and leading up to a spectacular hut on Kirwans Hill. Visit an open cast mine site with aerial ropeway, and a large quartz stamper battery. Lord Brassey stamper battery Kirwans Creek April 2011 • By glennj. Licence: C.
This track is usually walked in a clockwise direction. Start the track at Capleston or the Gannons Bridge car park at the end of Gannons Road. Lord Brassey Berdans • By Matthew. Licence: C.
Capleston was once a bustling gold town. All that remains today are some grassy fields surrounded by a variety of mature exotic trees. A car park is located at the end of Boatmans Road. Take the trail from here to Capleston and along Boatmans Creek. Over Boatmans Bridge, a wide old vehicle track heads upstream and into pleasant forest. The track soon leaves the road, dropping down and crossing Caples Creek. At a pretty waterfall, the track passes through a tunnel and over the Tunnel Swingbridge across Boatmans Creek. Old mining adits lie alongside the track. The track crosses the creek a couple times before commencing its climb on a spur between Topffer and Boatmans Creeks. The old mining road is evenly graded and easy going. Entering quintinia and silver beech forest, the track crosses a small saddle near point 952 before the final slog. A marked side track leads to the old hut site: a few bits of iron and wood in a snowberry-dotted clearing. Then another side track leads to Kirwans Hut and Kirwans Hill. Through a dark and mossy forest, the hut is located by a clearing with grand views out towards Reefton. 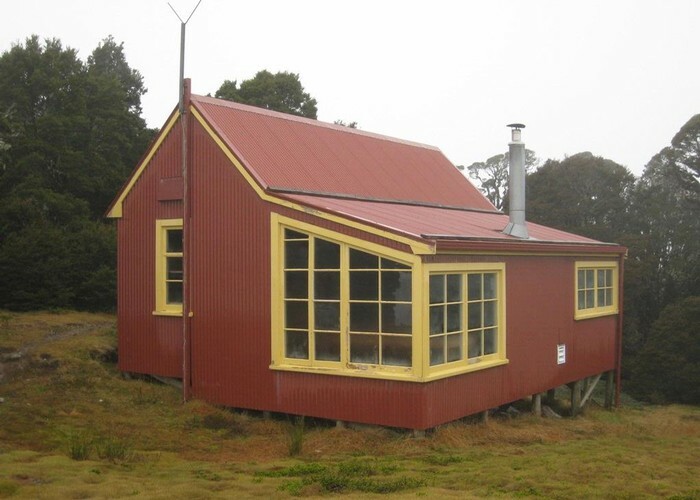 Kirwans Hut was designed by the architect, Graeme Craigie, and features picture windows facing the distant lights of Reefton. There is sheltered camping in a pocket clearing behind the hut. William Kirwan found gold here on Kirwans Hill back in 1896. The area was mined from 1900 to 1906. Leaving the hut, head back to the first junction under foreboding forest. The walk to the hill is a sidle rather than a climb, and very easy going. Push out onto tussock tops after 15 minutes, then pick your way along a vague trail to point 1315, then down to the slightly lower Kirwans Hill (1297m). There is a trig here and views out to the north, west, and south, if clouds don't choke out the scenery. Watch for giant land snails amongst the tussocks. 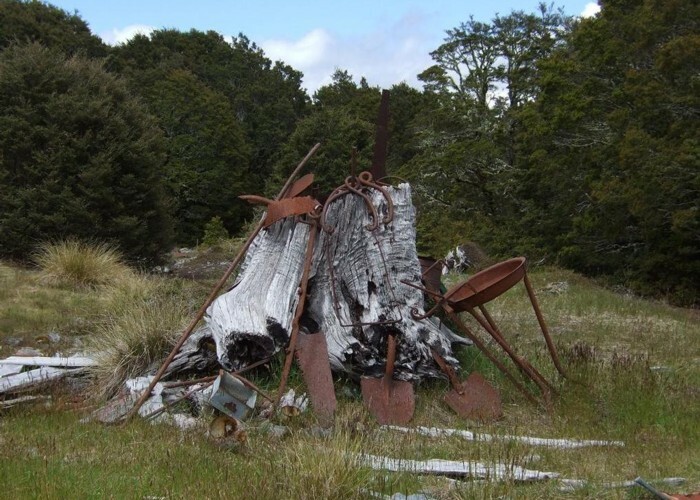 Relics at the old Kirwans hut site Dec 2008 • By glennj. Licence: C.
From Kirwans Hut, a few minutes' walk downhill leads back to the main track. Turn left and continue an easy sidle downhill. After a couple minutes, you will find the Kirwans Reward opencast mine site. A tumble of shattered quartz amongst the forest, and in the distance some pendant buckets still hanging from an old aerial ropeway. Just beyond here is the site of Mrs Flannigan's Boarding House. The site is very small, and as always with these things, it is hard to see how it all fitted together. Further downhill in the forest is the old transfer station. Cables, wheels, and miscellaneous ironwork are scattered beneath the trees. Some of the trees are growing through the artifacts, indicating that all this is regrowth. The track drops under red beech forest to fall alongside a small creek and on to the site of the Lord Brassey Stamper Battery. This large battery of 15 heads has been well restored, along with its berdan dishes. Ore from the mine on Kirwans Hill was loaded onto the aerial cableway, which worked by gravity. The battery crushed the ore to dust. This was passed over separating tables, with the gold separating out and bonding to mercury. The berdan bowls once contained heavy blocks of iron that further crushed the ore. Mercury in the bottom of the bowl bonded to released gold. In this way, about half the gold was successfully extracted. From the battery site, a mossy track under red beech forest leads easily downstream. The track soon turns along the Montgomerie River, a wide white gash of boulders shining through the trees, and follows it down to the hut at the junction with the Waitahu River. Little Montgomerie Hut lies at the end of a 4WD track. Hence the surrounding land is largely dried mud chewed up by tyres. Across the river is the appalling scar of the Garvey Creek Coal Mine, an operation that has sheered off the top of a nearby hill. All that aside, the Waitahu is a good looking river, and the view up the long valley and into the heart of the Victoria Range is quite beautiful. There is even a hut up there, about 14km upstream, Top Waitahu Biv, if you feel like a long bush bash. Kirwans Hut • By dicey. Licence: C.
From the hut, an obvious and muddy vehicle track heads downstream. After about 40 minutes, the foot track leaves the road and clambers up onto the hillside: the road goes into the river itself. Soon, you are back on the road, which crosses a dry river channel perhaps three times. The track leads over flat and easy kānuka flats and past the Clematis Bridge. 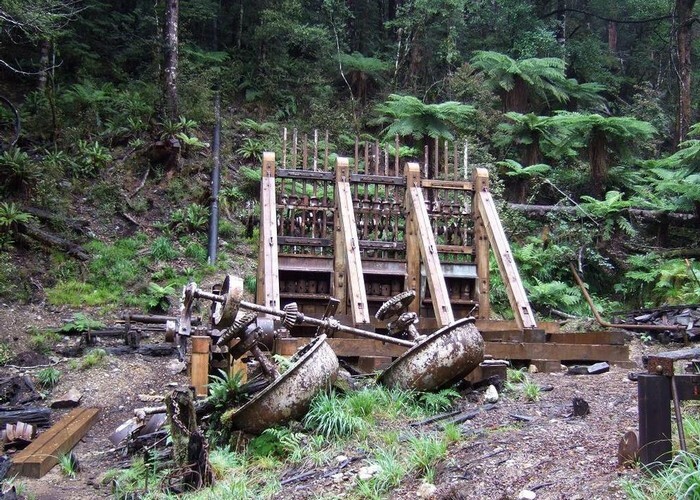 This swingbridge leads up to the Murray Creek Goldfields behind Blacks Point. The track continues on quickly and easily under nice beech forest, passing hints of farmland, blackberry, and coal dust before coming onto the Waitahu River Road and car park. Gannons Bridge is just ahead. This marked track sets off just before Gannons Bridge, as an old road through the forest. After a few minutes, the track turns off the road, uphill and onto the terrace which is planted out in pine forest. A wide road sidles the edge of the forest, and the poled route soon leaves it to drop down into Capleston. Another old road leads down through kānuka forest to the ghost town, coming out on a tree edged field. Start the track at Gannons Bridge or Capleston as you prefer. Added 1 June 2001 by MatthewMatthew. 5 revisions, most recently 5 March 2018 by MatthewMatthew. 516 views in the past year (43 per month).